This fall, the Fast Forward Film Series at Historic Northampton will present two screenings curated by Hope Tucker, Assistant Professor of Video and Film at Hampshire College. The series begins on Thursday, October 20th at 7 pm with a screening of Duncan Campbell’s Bernadette (preceded by several shorts TBD). The series concludes on Thursday, November 3rd at 7 pm with a screening of Kazuhiro Soda's Campaign. Both screenings will take place at Historic Northampton, 46 Bridge Street, Northampton, MA. Bernadette is a portrait of the Irish dissident and political activist, Bernadette Devlin by artist Duncan Campbell. This screening is co-sponsored by Hampshire College and X (Unknown Quantity), a film series supported by the Amherst College English Department and Film & Media Studies. Kazuhiro Soda is a Japanese documentary filmmaker who has lived in New York since 1993. He is known for his observational style and method of documentary film-making. 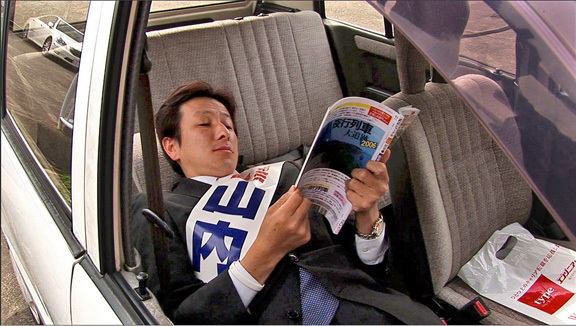 In 2005, Kazuhiro Soda shot Campaign (2007, 120 minutes), depicting a political campaign in Kawasaki, Japan, by Kazuhiko Yamauchi, an inexperienced candidate officially endorsed by the Japanese Liberal Democratic Party. When completed, it was invited to the forum section of Berlin International Film Festival in 2007. PBS broadcast a 52-minute version, which won the Peabody Award in 2008. The TV version was broadcast under a different title, Campaign! The Kawasaki Candidate as part of the Why Democracy? series, a global media event co-produced by 33 broadcasters around the world, including the BBC, CBC, and NHK. The 120-minute theatrical version won the Best Documentary Award at the Belgrade International Documentary Film Festival in 2008. Hope Tucker, assistant professor of video and film at Hampshire College, holds a B.F.A. from the School of the Art Institute in Chicago and an M.F.A. in Film and Video Production from the University of Iowa. A MacDowell and Yaddo Fellow and recent artist in residence at Phillips Academy Andover, she has taught video, film, photography, animation, new media, and visual studies in the US and the UK.